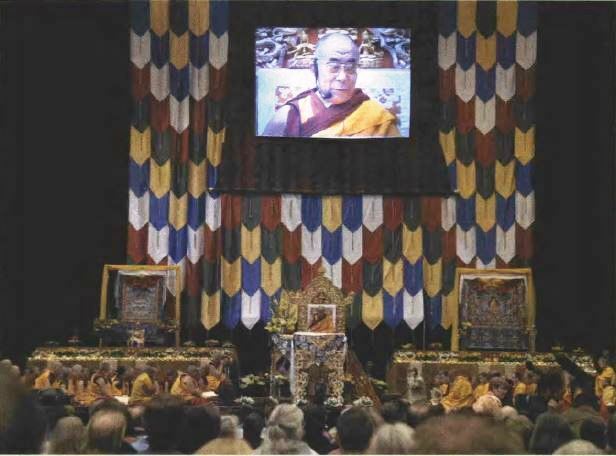 Earlier this year, I was asked to transform a livestock and rock concert arena into sacred space for His Holiness’ teachings in Madison, Wisconsin. It was a wonderful opportunity for service and for honoring the Tibetan traditions while also incorporating Western elements. Design parameters included many technical considerations as well as the need for a teaching environment conducive to a multicultural audience ranging from serious students to non-Buddhists. What would all of that look like, exactly? As a design method, I find linear thinking ineffective. Letting these questions float at subliminal level, I returned to daily study and practice. When a practice session morphed into distraction and a visualization of the stage design, I got up from my cushion and started drawing.